Today started with some trepidation, I have to be honest. When I got home from my bike ride yesterday I turned on the TV news. It’s hard not to do that when there’s a sense of urgency in the air, and it’s hard to stay vigilant against the sway of the news, its steady insistence that your city is going up in flames, that your neighbors aren’t your neighbors but your enemies, that suddenly it is the apocalypse, even when you know the apocalypse has been here for decades upon decades in the guises of deindustrialization, urban renewal, the drug war, the meteoric rise of mass incarceration–the list goes on and on and on. The problem with The Event, though, is that it collapses time, and those histories, and even the present moment, the murder of Freddie Gray, disappear, replaced with fears about a faceless mob on the attack. It was hard to go to sleep last night, but I did, and this morning I got up, got on my bike, and headed downtown to catch the shuttle out to the county for work. The bike ride was a quiet one, I think because city schools were closed and state workers were staying home which meant, again, I had the streets largely to myself. I saw some signs of the previous night’s uprising: empty shoe boxes on 32nd and Greenmount, boards on windows on the Westside, but mostly everything looked the same as it did the day before, all the inequalities etched on the surfaces, as always. I didn’t see my first evidence of our new occupation until I got down to the University of Maryland Medical Center at Lombard and Greene where I lock up my bike. There I saw six national guard soldiers in full war zone garb: helmets, bulletproof vests, machine guns (or that’s what they look like–I’m don’t actually know my guns all that well), shields, restraints, the whole shebang. There were also a couple of state troopers, and all of us were staring at our phones. They were doing the same thing when I got back this afternoon–they looked so bored. A lot of soldiering is just standing around, and these dudes (and almost all were dudes–I hope someone’s writing about the masculinity on all sides of this show) definitely had that part down pat. I got on my bike and rode over to the sports stadiums to check out the tanks and the public buses diverted for their use. There was a food truck there, and so many people lying around in the sunshine, some napping. I next headed to the Inner Harbor where troops were stationed in clumps along the bike lane, surrounded by cases of water, empty boxes from Pizzeria Uno, bags from the Cheesecake Factory, and bagel platters balancing on trucks and tanks that totally do not belong on the bike/ped path, but there you go. The Harbor was largely empty and stores were already closed, but I managed to get an order of fries before heading over to City Hall where I snapped this picture of tanks and soldiers and a monument to a soldier in front of our fancy civic building. The block was ringed by media–even Anderson Cooper has found his way here–and it had the feel of everyone being way too early or way too late to a party. This city is loaded for bear, and I thought to myself, if nobody brings a fight, I wonder how many of these people will be kinda disappointed. I got on my bike and rode up the hill to home, past the Juvenile Justice Center and Healthcare for the Homeless and the many outlets of Baltimore’s prison industrial complex on Fallsway. 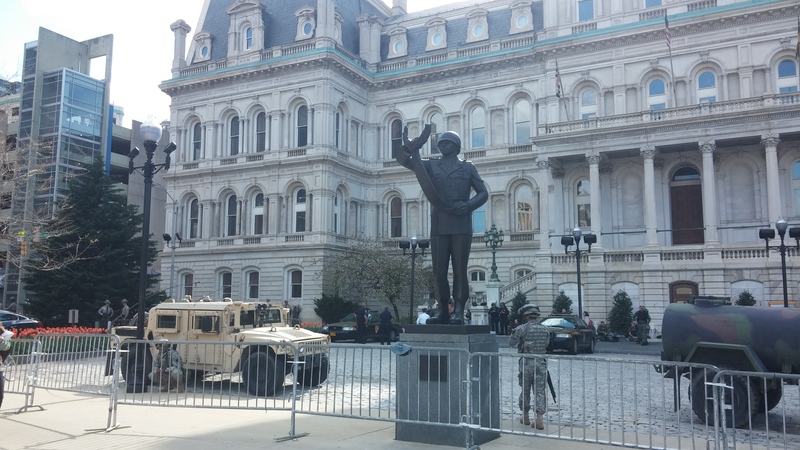 This stuff can fade into the background in a way that all the tanks and soldiers can’t, but make no mistake: today isn’t the day that Baltimore got militarized. That happened a long time ago, and if anything, perhaps The Event can help us see that again. This entry was posted in police, politics and tagged Baltimore, Baltimore Uprising, City Hall, Freddie Gray, media, militarization, National Guard, riots. Bookmark the permalink.